Unfortunately, many observers confuse declines in cigarette sales following a tax hike with smokers “breaking the habit.” That is, they often assume that if legal cigarette sales drop by 20 percent after a tax hike, it is a direct function of people no longer smoking. sales response” to a cigarette tax hike is due to tax avoidance, not quitting. [†] When Florida was first considering $1.00 per-pack tax hike in 2009, we estimated in an unpublished calculation that legal sales of cigarettes in Florida would decline by 19 percent as a direct result of smuggling. There is ample empirical evidence that such smuggling occurs. In our 2008 study, we reviewed some of this evidence. Since then, more has emerged. For example, in March 2010, the U.S. Bureau of Alcohol, Tobacco, Firearms and Explosives reported that prior to 2003, the bureau averaged only 40 new tobacco “diversion” (smuggling) cases each year. Since 2003, that annual average has leapt to 131. In the state of Michigan, there are currently two significant federal cases being prepared against seven individuals for their alleged involvement in massive cigarette smuggling. The complaints were recently dismissed, but only to allow the government more time to prepare indictments. Both cases involve individuals located near a Michigan Indian community and cigarette shipments from and to low-tax Kentucky. In the first case, the affidavit filed in support of arrest warrants for the suspects alleges that between October 2008 and July 2009, they acquired more than 40 million untaxed cigarettes from an undercover ATF agent. The cigarettes were allegedly purchased with $4.3 million in cash, cashier’s checks and money wired to the account of the undercover agent. Remarkably, these men not only may have transported untaxed cigarettes into Michigan (and had them mailed using the U.S. Postal Service); they also allegedly exported a large portion of untaxed cigarettes to Louisville, Ky. In the second case, in an affidavit filed in support of the arrest warrants, five individuals were alleged to have purchased more than 16 million untaxed cigarettes for approximately $1.8 million between July 2007 and July 2009. The cigarettes were shipped to Michigan, Nevada and California. According to the affidavit, the orders shipped to all three states were “brokered” by a man from Baraga, Mich., and the checks used to pay for the cigarettes were allegedly drawn from Upper Peninsula businesses, including an outfitter, a pizza shop and a tobacconist. [*] Smuggling has a long pedigree in the United States. America’s founding involved at least one alleged smuggler: John Hancock. Evidence also indicates that during the Civil War, the Confederacy smuggled pain killers from Europe inside of dolls. Steve Szkotak, “Confederates Used Dolls for Drug Smuggling,” Cape Cod Times (Associated Press), October 28, 2010, http://www.capecodonline.com/ apps/pbcs.dll/article?AID=/20101028/NEWS11/101029741/-1/rss04 (accessed Nov. 17, 2010). During Prohibition, Americans acquired liquor by smuggling booze in everything from hollowed-out watermelons to gas tanks outfitted to hold both gasoline and whiskey. 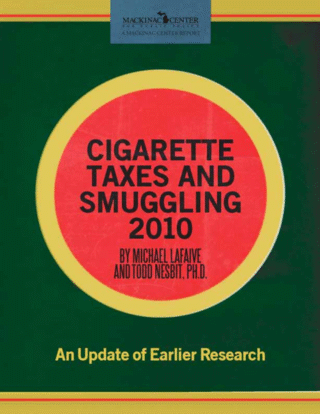 LaFaive, Fleenor, and Nesbit, “Cigarette Taxes and Smuggling,” (Mackinac Center for Public Policy, 2008), 87, http://www.mackinac.org/archives/2008/s2008-12.pdf (accessed December 10, 2010). [†] Other studies have produced similar conclusions. In 1995, R. Morris Coats argued that 80 percent of the sales response to cigarette tax hikes can be explained by cross-border shopping. Coats, “A Note on Estimating Cross-Border Effects of State Cigarette Taxes,” National Tax Journal 48, no. 4 (1995): 573. In a 2007 study, economist Joel Slemrod of the University of Michigan referenced Coats’ work, but argued that this figure would be smaller if Coats took into consideration “enforcement regimes” that raise the cost of cross-border smuggling. Joel Slemrod, “Are Tax Elasticities System-Dependent? Evidence from Michigan Cigarette Tax Policy” (2007): 5. Josh Hafenbrack, “Cigarette Sales Plunge since Florida’s Tax Increase,” TCPalm.com, Nov. 16, 2009, http://www.tcpalm .com/news/2009/nov/16/cigarette-sales-plunge-floridas-tax-increase/ (accessed Oct. 20, 2010). Alexis Antonacci Lambert, e-mail correspondence with Michael LaFaive, Oct. 19, 2010. Hafenbrack, “Cigarette Sales Plunge since Florida’s Tax Increase,” TCPalm.com, Nov. 16, 2009, http://www.tcpalm .com/news/2009/nov/16/cigarette-sales-plunge-floridas-tax-increase/ (accessed Oct. 20, 2010). Stehr, “Cigarette Tax Avoidance and Evasion,” Journal of Health Economics 24 (2005). LaFaive, Fleenor, and Nesbit, “Cigarette Taxes and Smuggling” (Mackinac Center for Public Policy, 2008), 22-65, http://www .mackinac.org/archives/2008/s2008-12.pdf (accessed Dec. 10, 2010). “Fact Sheet: ATF Tobacco Diversion” (Bureau of Alcohol, Tobacco, Firearms and Explosives, 2010), 2, http://www.atf.gov/ publications/factsheets/factsheet-tobacco-diversion.html (accessed Nov. 2, 2010). Susan Gillooly, e-mail correspondence with Michael LaFaive, Nov. 5, 2010. John Franklin, “Affidavit of John Franklin in Support of Criminal Complaint Against [Two Individuals; Names Redacted]” (testimony before the United States District Court for the Western District of Michigan, Aug. 4, 2009). John Franklin, “Affidavit of John Franklin in Support of Criminal Complaint Against [Five Individuals; Names Redacted]” (testimony before the United States District Court for the Western District of Michigan, Aug. 4, 2009).